Fired from his job and suffering from severe emotional and psychological trauma, a brilliant engineer-mathematician has committed suicide after harassment, intimidation, and threats by the neo-Bolshevik antifa activists. A young, educated, and successful 34-year-old man who participated in the Unite the Right rally in Charlottesville, Va. last summer committed suicide after being harassed, intimidated, and threatened by members of the radical leftist antifa (neo-Bolshevik) group for his participation in the controversial and violent rally that garnered international attention. According to his obituary, Andrew Dodson, originally from Greenville, S.C., took his own life at his home on March 9. Dodson graduated from Clemson University in 2007 with degrees in electrical engineering and mathematics, and began working for DuPont in Louisiana shortly thereafter. He soon decided to continue his education, and enrolled at the University of Arkansas to pursue a masters in electrical engineering, which he never actually completed. Dodson eventually moved to Boston to work for a number of companies specializing in advanced nuclear reactor design. He began working for Elysium Industries Ltd. and was associated with over two-thirds of the provisional patents developed by the company in just 18 months. He later worked for Zora Energy Renewables Ltd. and played a major role in the direction of the company, as he was critical to developing virtually all of the company’s intellectual property. Following the Unite the Right rally and the publicity his presence and participation generated, he quickly became a target of antifa activists and mainstream journalists, who exposed his identity and harassed him online. He was fired from his job and suffered from severe emotional and psychological trauma. Photos emerged of Dodson wearing an “Arkansas Engineering” t-shirt at the rally. Multiple individuals associated with the university, including a professor, were misidentified as Dodson after the photo was shared on social media and in local newspapers, and many of them were harassed online. Dodson ultimately took credit as the man in the photo and spoke with local media outlets in Arkansas to set the record straight. Although Dodson did not graduate from the University of Arkansas, he appeared to have enjoyed his time spent there and “learned so much” from fellow engineering students and faculty at the university. 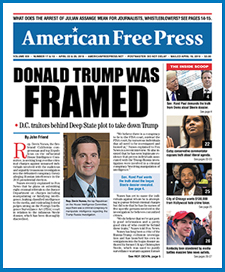 “…A major threat from a radical leftwing group to our national security … Evidence of collusion comes directly from the FBI, which discovered that Antifa—the leftwing terrorist group that has thrown M-80 explosives at pro-Trump demonstrators and helped make college campuses virtually no-go zones for conservatives—has connections with foreign terrorists.” See AFP Online Store for more. Dodson had prior experience with political activism and campaigned for Ron Paul in 2008. He later participated in both the Occupy Wall Street movement and the Tea Party, and ultimately decided to go to Charlottesville to attend the Unite the Right rally because he wanted to “see who these alt-right people were,” despite the hostile media coverage of the burgeoning political movement. Dodson encountered the right-wing activist group Identity Evropa during a torch-lit rally on the evening of Aug. 11, the day before the actual Unite the Right rally. Identity Evropa, Dodson discovered, was an “identitarian group” that denounced white supremacy and neo-Nazism, which Dodson appreciated. He explained to local media outlets at the time that he did not “see any Nazi flags, just a bunch of guys in khakis and polos,” referring to the Identity Evropa activists. He thought the rally and many of the individuals participating in it were legitimate activists rather than white supremacists and neo-Nazis. He did eventually encounter members of the KKK and neo-Nazi groups at the rally, but he told reporters he thought that they were bused in along with the more radical counter-protesters, who initiated the violence during the rally. “I wonder if the same people that bused in the Black Lives Matter [protesters] and the [anti-fascists] and the communists—are the same people busing them in and . . . busing in the Nazis and the KKK,” Dodson asked the Arkansas Times. John Friend is a writer based in California. Charlottesville has been demonized from day one. Characterized as something it wasnt by the media-enabled these people to victimize and harass this man, and MANY others! Those of us WHO KNOW BETTER-anybody who looked into it-knows Charlottesville was NOT about white supremacy! Maybe if WE had spoken up and added our voices to POTUS’, this could have been prevented. It makes me ill to think that THIS is exactly what antifa wanted! Our American courtesy is not working. THE TRUTH, raw, blunt, painful truth, IS the only thing we have that works! When we are quiet, out of fear of retaliation, we are making the enemy that much stronger. Be brave for the men like this one, who did nothing to deserve what is/was done to them. We CANNOT remain silent while we watch them die! This is going to be my son, your son, brother, grandchild tomorrow. Must we WAIT until THEN to care?! To act? !